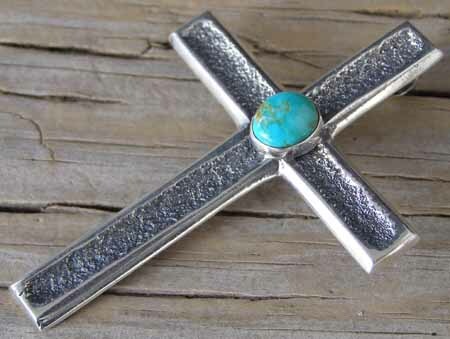 Here is a handmade sandcast cross pendant by Navajo silversmith Gary Custer. Gary set this with an oval of natural, untreated Royston turquoise in a smooth bezel. This cross has a shepherd's hook on back so that it can be worn on a chain, 4 mm. Sterling beads or on a leather cord. We include a leather cord with this so it can be worn right out of the box (cord not shown). Cross: 2 3/4" x 2"